David Willetts MP, Minister of State for Universities and Science, Speaking in Cambridge on the 3rd of March 2011. 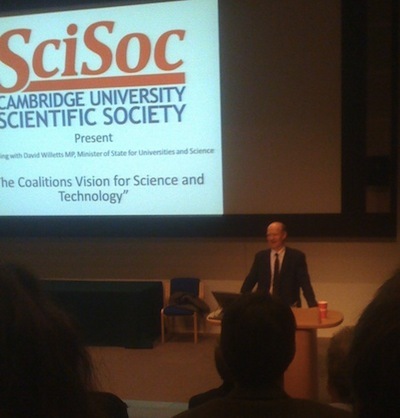 On the evening of the 3rd of March 2011 I went to listen to Universities and Science Minister David Willetts speaking at the University of Cambridge. As the minister sought to defend his Government’s policy of allowing tuition fees to rise to £9,000/year he came across like a dodgy sofa salesman as he repeatedly urged those present not to think about the [huge] total debt but just to focus on the low re-payments. I asked Mr Willetts about the effect huge tuition fee debts would have on graduates seeking mortgages. I noted that my MP Julian Huppert had asked him this question in the Commons only to be given the line about focusing on the re-payments and not the total debt. I asked the Minster on what basis he had made that statement, and if the financial industry had given him assurances they wouldn’t take into account the total amount of debt an individual was in or how long they would be paying it back for. Mr Willetts responded to say that he had received an assurance from the Council of Mortgage Lenders that all they will be interested in will be monthly outgoings. Without the bank of mum and dad, how can someone saddled with this scale of tuition debt ever afford to buy? Spotting this last-minute iceberg on the day of the tuition fee debate, Vince Cable got a written assurance from the Council of Mortgage Lenders that saddling millions with tens of thousands of debt won’t make a blind bit of difference to their lending decisions. The return letter from the CML is a masterclass in obfuscation; Cable gets his assurance at the start of the letter, but at the end the CML suggests that it probably will make a difference after all. There is a document from 2003, when top-up fees were being considered, showing the CML was then saying that the increase in student debt would delay the average age at which graduates would be able to get a mortgage. Minister Mr Willetts made an argument that currently people struggle in their 20s and 30s as they try and buy homes, but then had more spare income as their incomes raise and outgoings on loans drop in their 40s. He argued that this represented an opportunity, for tuition fee debt to be collected over a longer period extending later in life. He said that the arrangements had been “deliberately done this way to spread the burden”. What he didn’t make any reference to was what people often start doing in their 40s-50s paying more into their pensions and starting to get their affairs in order for retirement. Under his proposals very many people are going to be paying student debt off over much of entire working lives (the Government’s “Scheme” involves raising the period over which re-payment is to be made to 30 years). Willetts again said it wasn’t about the debt. “Regarding it as a stock of debt is misleading” he implored. Faced with the obvious skepticism of the audience he re-phrased his point saying: “It’s not like leaving university with a credit card debt”. I don’t think he won anyone over when he changed tack and described the government proposals as “only a 9% extra rate of income tax, only charged on those earning above £21,000″. Martin Lucas-Smith an Academic-Related member of Cambridge University staff asked about variable tuition fees. When tuition fees were brought in they were a flat rate of £1,000 per year; under the government’s current proposals it is already clear that many universities will not charge the full £9,000 per year. Mr Lucas-Smith questioned if seventeen year olds ought be being asked to consider which university course to embark on based not only on their abilities, aptitudes and aspirations but also taking into account what they can afford. He also argued that seventeen year olds are not the rational economic agents which the government’s view of higher education as a market place assumes. This was clearly a point the audience, especially the older individuals who were presumably university academics, agreed with. Mr Lucas-Smith also suggested that many young people, especially those from poorer families, had a cultural suspicion of university and an aversion to debt of debt, and that they might be put off, particularly what he said were mis-percieved as “posh unis” like Cambridge which will be charging the highest fees. Minister Willetts started by saying that the suggestion that higher fees would put off students from poorer families was one of the reasons he and his party had opposed top up fees of £3,000 (Mr Willetts’ full voting record on tuition fees, Key top-up fees vote). Willetts went on though to say that since top up fees had been introduced the evidence had been that students from lower income families had not been put off. He said that in his experience the problem was not an aversion to debt, but young people thinking they had to pay tuition fees. They don’t have to pay he insisted. “People mis-assume they have to pay, or assume they have to pay it back”. As the minister was saying this I noted down: “He’s trying to argue it’s not real money”. Another of those present suggested that some young people strongly feel they don’t want to be a drain on their familes, but a contributor, and were scared by the interest pilling on student debt. Reducing the size of the teaching grant over time. He said this was the least visible way which could have been chosen to make the required savings. He said universities would have struggled, but we wouldn’t have seen large scale protests. He said the problem with this option was that the quality of the student experience would deteriorate. Reducing student numbers. The argument against that given by Wiletts is that he says there is evidence that the average “graduate premium” of £100,000 of extra earnings over the course of a life time appears to be continuing despite the increase in student numbers; so based on that reducing student numbers would be both bad for the economy and would deprive lots of people of a valuable experience. The minister gave no indication as to where this key piece of “evidence” he is relying so heavily on has come from. The size of the “graduate premium” has historically been a disputed topic. Increasing student fees. Minister Willetts said this was the “morally correct thing to do”, justifying it again with reference to the “graduate premium”, saying that graduates benefit financially from a university education so ought pay for it. (Willetts made no mention of the benefits to the country, the taxpayer in general). A questioner claimed the minister had criticised universities for rushing into setting high fees; but claimed it was actually government putting pressure on the universities. universities that have rushed to £9,000 will end up looking rather silly. The minister was asked if, in a long term view, there was any hope of a return to free education. The argument had been made that the fee increase was due to the need for spending cuts, so it was reasonable to ask if they would be removed if and when the country became richer again. Willetts responded with the rather abstract: “Free is a slippery concept”, and made clear the answer to the question was: “No”. Willetts had said that his Government was working on the assumption that 70% of the funds lent to students would be paid back, and 30% would be written off. He was asked what would happen if those estimates were wrong. Willetts said what the Government was working with was an ‘imperfect estimate’ and that one of the key variables was how many women worked / returned to work after having children. He said he thought the 70:30 was a “reasonable central forecast”. Clearly if the predictions are wildly wrong there is potential for enormous problems. Mr Willetts’ face suggested he may well have been briefed on a worst case scenario and be aware of the kind of financial meltdown he could be leading the country into. A questioner claimed there had been no proper national debate on tuition fees, and called for one. Following a question Willetts agreed the take up of PhDs would be affected by tuition fees. Willets did not come to Cambridge specifically to talk about tuition fees, though he joked about how his talk had been billed by the national media as being to defend the coalition’s higher eduction funding policies. The Minister started by apologising for the “rather intricate procedure for getting tickets”, and, presumably in reference to the security and protestors outside said: “sorry for the disruption caused”. He started by saying the country was getting more scientifically literate, and that the reporting of science in the press was getting better and more common. He said that throughout society scientific arguments are becoming more important. Giving an example of how scientific evidence had influenced him as a minister he talked about university admissions, and how he had been able to announce that the access agreements that universities will have to come up with to enable them to charge fees over £6,000 per year should say that universities will judge on the basis of prospective potential and not on the basis of what an applicant has accomplished already. He claimed this decision was based on “rigours analysis” of the performance of students. Willets then spoke about access to the “research intensive universities”; clearly implying he thought those were the good ones. I agree, I think the defining aspect of a university education is that it is closely linked to cutting edge research, and teaching is by active researchers, but it was surprising to hear the minister say this. The minister then said science wasn’t the only discipline that mattered; illustrating this with an example of a vaccination campaign; while scientists can provide the vaccine others might have to be involved in persuading population to accept it. Willetts stated his government’s had committed to “protect in cash terms the complete £4.6bn science budget” and said: “we will continue to support blue skies research, without people having to make clunky attempts to predict what will happen in 20-50 years time”. Willetts quoted Thatcher on CERN reporting that in a briefing on potential economic benefits, or the lack of them, she retorted: “Yes, but it’s very interesting isn’t it”. The minister said that clustering was essential; that government can’t create clusters but can sustain one and enable it to grow and that was absolutely critical for the high tech industries of the future. He said that the value of clusters is that they are “a low risk environment for high risk activities”, explaining this by saying there was no need for people to move their homes and families if the project or company they were working on failed. The minister related how when he had been to the topping out ceremony of the new University of Cambridge Molecular Biology laboratory he had been told that a key part of the building’s design was to ensure no coffee was available anywhere but on the top floor canteen, and efforts had been made to make that the finest room in the building. Success in science and technology requires people to be physically located together he said; saying that he had visited Microsoft and found that there too all the key people worked, not remotely as you might expect from a high-tech IT firm, but all within 1/2 a mile of each other and regularly meeting up in person. On the coalition’s vision for science, Willetts said that the government appreciated the “shear inherent value in blue skies research”, especially in clusters. He said it wasn’t important if people didn’t stay working as scientists as they diffuse out and then the “adsorptive capacity of the economy is greater”. I didn’t understand what he was on about then, and when he went on to say “scientists in the rest of the economy track what’s happening elsewhere in the world” I was non the wiser. Only 40% of those with STEM degrees go onto STEM employment said Willetts. He claimed there was uncertainty among STEM students about what they wanted to do, and this uncertainty makes them susceptible to the persuasive powers of recruiters from mainstream big companies who put significant effort into high profile recruitment. He said there is not a similar high profile for the opportunities for STEM related employment in small to medium sized companies. He said that while earnings don’t appear to be the most important thing to STEM graduates, STEM related jobs do command a premium. Willetts said that research his department would be releasing tomorrow (Friday 4th March) would explain in detail “what’s happening to STEM graduates”, where they end up employed. (I’d say on my undergrad degree course (Biochemistry, Imperial) the one thing that almost all of us would have agreed on career wise is that we never wanted to be post-docs – our course was fantastic in that it gave us insight and experience into academic science). Willetts was asked if he thought his proposed reduction in overseas student numbers would have an effect on quality. He responded to say that he didn’t want to see those with the required qualifications barred from coming to study in the UK; and that he hoped to come to an arrangement with the Home Office to enable that, while tackling abuse of student visas. A smartly worded question asked the minister why once non-EU students had received an good education at a UK university we weren’t prepared to let them work in the UK and benefit from their contribution to the economy. Willetts had no answer to this question; though is pursuing a policy of clamping down on post-study work. A questioner asked why we had lots of funding bodies and research councils and not just one; the suggestion being that one funding body might do better at funding collaborative research. Willetts claimed that there wasn’t a problem and collaborative work was rewarded. A questioner asked how government balanced conflicting demands for research funding, how ministers decided if they should fund particle accelerators or environmental research for example. Willetts said he valued the “Haldane Principle” which said its up to researchers, not ministers, and there’s a boundary beyond which its not acceptable as a minister to go when expressing views on the value of research. He did though describe “challenge funding” which he described as “Ministers identifying what they see as challenges facing the globe” [and making money available for proposals which fit into those areas]. Willetts was asked about problems bringing post-doctoral research scientists into the UK from countries such as India where post-docs get paid very badly. The questioner said that he was aware of brilliant people who scored badly on the government’s points based system, largely on the basis of their salaries. The minister gave a very positive response, saying that he hoped the UK would move to a system of using a different benchmark, for example making an assessment of an individual’s salary relative to a “reasonable salary” for say an Indian scientist. (Quite why he was still sticking to assessment by salary I don’t know, and we didn’t find out as with lots of people wanting to ask questions there were no opportunities for a follow-up). Willetts was asked to comment on Scientific Advice to Government, in light of the experiences with the Advisory Committee on the Mis-use of Drugs. He stated that Ministers were now required, though a code, to take scientific advice. A system was described where almost all ministers have their own scientific advisors and there are systems in place for ministers who want to challenge the quality of their scientific advice to follow. A questioner raised the cutting of all specific “women in science” funding from the end of the month. Willetts said this was disappointing but happening. In the area before the event there was a large police presence. There was a police van on King’s Parade, and a number of pairs of police patrolling the perimeter of the New Museums site on Downing Street. I walked through tens of anti-cuts protestors on the steps up to the Babbage Lecture theatre (behind the whale) only to be faced by security guards manning a barrier. I went down to ground level again and found a clear way up being guarded by two members of University of Cambridge Security Staff. They checked my ticket (registration in advance was required) and my passport (Photo ID was also required) and let me through. On walking to the top of the steps my ticket was again checked by someone in a suit and cape who I suspect was a University Constable. A woman in an academic hat and other costume was hovering in the foyer – a university proctor perhaps – and my ticket was again checked, for the third time, by two of the student organisers, to whom I paid my £2 entry fee. I was directed to the door of the lecture theatre; only to be bellowed at by one of the proctors / constables (a rotund chap with a hat) who ordered me to leave my bag outside. This was only a small rucksack containing my laptop and notebook but he clearly wasn’t in the mood for accepting anything but compliance and I wanted to hear the Mr Willetts, so I emptied out my valuables into my pockets and made my way in. As I entered I noted that those looking obviously feminine had been allowed to take handbags not much smaller than my own bag in. Despite spending a number of years within the university, this was my first experience of the “bulldogs“. Anti-cuts protestors were chanting the same: “No ifs, no buts, no public sector cuts” chant as they had been at the Guildhall, and Shire Hall during the budget protests. I recognised a couple of the protestors from the previous protests. This time many of them had drums. There were maybe 30+ protestors on the outside raised area outside the lecture theatre, many were still there when the event finished. For a short period during the event drums and chanting could be heard from inside, but it didn’t disrupt proceedings. During the events the woman in the most fancy dress, who students present appeared to think was a proctor, sat in a prominent position in the front row of the lecture theatre. Burly men stood in the wings of the stage, and behind the audience. When I took my camera out to film the minster, and bring his words to a wider audience I was asked to stop, being told it was contrary to “University Rules”. A Google Search of the Statutes and Ordinances suggests there is no such rule. After the event the protestors appeared to be looking to see if they could find which way the Minister was leaving, looking into cars which were moving around the car park, but I suspect he may have been bundled into the bowels of the university. An article I wrote on my thoughts prior to the event. Article containing my views on undergraduate tuition fees. Mr Willett’s Special Advisor, Conservative Nick Hillman, who fought the Cambridge seat and lost after declaring during the campaign that £7,000/year for a Cambridge University education would be good value for money was not present. This entry was tagged Cambridge University, Economy, Universities, University of Cambridge on March 4, 2011 by Richard Taylor. I say “evidence” as it can only be a model / prediction. My view is that an individual can, just like a party, set out the principles they believe in and will apply to situations which arise. I spoke to Jeremy Sallis on BBC Radio Cambridgeshire at 0712 about the Willetts’ event. He was particularly interested in the protestors, but I was also able to report the Minister’s key line that we should ignore the actual amount of student debts and just focus on the low repayments. That third sentence in the section about 17 year olds still needs tweeking, Richard. Good article otherwise for those of us not able to be there. Thanks. In response to my FOI request the BIS department has released the advice it has received from the Council of Mortgage lenders. The emphasis is not mine, but that of the CML. Repaying student loan will also diminish and individual’s ability to save therefore potentially delaying entry into home ownership if lenders continue to require substantial deposits (as we can expect them to in the short to medium term). And they will get a better interest rate if they can get a bigger deposit. The correspondence released shows David Willett’s office have been pushing for “clarity” and the CML have responded to say their statements, as above, are “as specific and clear as we can get”. The CML’s view that the quantity of debt won’t be taken into account, rather just the level of repayments, is based they say on the fact credit reference agencies don’t have access to student loans data; not that they wouldn’t take that into account if they did have access to it, or if they could find it out – for example by requiring the information mortgage applicants.